One essential feature of any waveform capture system is the ability to zoom into a large data set rapidly. The figure below shows a block diagram of the basic structure of the DL850E. 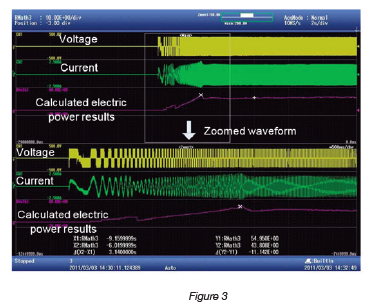 Input data is digitized at the A/D converter of each input module and sent to the acquisition memory via the GIGAzoom Engine® 2, which is Yokogawa’s unique data processing circuit. On receiving data, the GIGAzoom Engine 2 determines whether the trigger condition is met and, if so, stores the required data before and after the trigger in the acquisition memory. The GIGAzoom Engine 2 also has a special engine for displaying waveforms and thus can draw waveforms of the data in the acquisition memory at high speed. This function allows the DL850 to quickly display the waveforms of all the data even within a large maximum memory capacity of 2 Gigapoints (2 x 109 data points). After observing waveforms and zooming into the details, it is often desirable to automate some data processing to isolate the interesting behavior of the signals. For these situations, the optional real-time math processing unit is used to process the data. Yokogawa’s Real-Time Math processing unit works on a dedicated hardware math circuit specifically to allow the high-speed processing and make processed signals available for all the same features as unprocessed data signals. This is achieved because the signal processing happens before trigger detection and before inserting the data into memory. The result is that a processed channel can be used as a trigger source, and processed values can be stored simultaneously with the raw data. ScopeCorders allow for up to 16 simultaneous processed channels (called Math Channels). Because the processing is performed in hardware, not software, calculation rates up to 10 MS/s are possible on 16 math channels at the same time, far outstripping the capabilities of PC and operating-system processing. At the bottom of the document we list all available computing functions, and the sections below will explore a few examples in depth. It integrates instantaneous power values, which are a product of voltage and current, for one cycle to calculate an effective power value for this cycle. The calculation is repeated and the result is updated every cycle. Take as an example the voltage and current waveforms shown in Figure 2. During Period T1, which spans from a negative-to-positive zero crossing point of the voltage signal to the next point, the product of voltage and current at every sampling period Dt is integrated. The time of T1 is measured automatically, and at the end of this period the integrated result is divided by T1 and updated as the electric power value. The same process is repeated in Period T2, and at the end of this period, the electric power value is updated again. This electric power calculation is performed for every waveform cycle, so the changes in electric power can be precisely recorded even when the waveform cycle time fluctuates. For example, the waveform cycle time transiently fluctuates during the start-up of a motor, and the DL850 with this function can follow changes in the waveform cycle time and record the electric power value in real time for every waveform cycle. With the high-speed calculation of 10 MS/s, the DL850 can catch all data and calculate the electric power value of a pulse width modulation (PWM) waveform of such devices as inverters. The screen capture below shows an example of an electric power measurement at the start-up of a motor. The DL850 precisely measures changes in electric power during the start-up of a motor. Often the measurements with a motor will coincide with measurements of a resolver or encoder. The ScopeCorder is also capable of decoding these types of sensors for position feedback. Resolvers are often used for detecting motor angles of hybrid cars and other vehicles as they are excellent in environmental resistance. 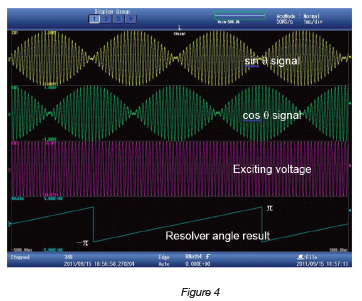 As shown in Figure 4, the resolver sensor detects the sinusoidal exciting voltage applied to exciting coils mounted on the rotor by using the two orthogonal sensing coils and outputting two signals (sinθ and cosθ) corresponding to the angle θ of the rotor. To calculate the angle, the Resolver Math function automatically detects the cycles and phases of the sine and cosine signals, compares them with the excitation voltage waveform, and provides the resulting angle values to the ScopeCorder’s memory for display and logging. Due to the inclusion of a tracking loop filter in the Resolver Math firmware, the angle measurement is even stable when the resolver signals are briefly interrupted by noise. Using the optional Real-Time Math feature of Yokogawa ScopeCorders lifts the burden off of post-processing and gets engineers the results they need sooner. By using math channels as trigger sources, trending and recording math channels to storage, and by using measurement specific calculations such as resolver math, gain the advantages of a custom data acquisition system without the need for custom software.